>We all like to take our dogs on walks or let them run, run, run in the backyard or dog park. But this year, with this incredibly oppressive heat, we’re seeing the effects of that heat more than we ever have. PLEASE be careful with your greyhounds! They are like kids – when they’re having fun, they don’t know when to stop. You have to be the smart one. Remember – greyhounds have no subcutaneous fat layer and that means they have no insulation against heat or cold. 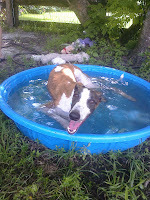 If you think it’s hot for you, then it is hot enough to boil a greyhounds’ blood. I know you think I’m being an alarmist but I want YOU to become an alarmist. We have already had one dog die and we’ve had several (3 that I personally know of now) that have been critical but have pulled through. A Primer on Overheating: A greyhound’s normal body temperature should be about 101 to 101.5. Excessive panting, buckling knees and glazed look are all symptoms you need to be aware of. Have a thermomet er ready and don’t be afraid to use it. A digital reads easiest and they’re not expensive. If you have one of our first aid kits, there’s one in there. (Yes, the temp is taken rectally. Live with it.) If the temp is at 103 or more, it’s time to act. Treatment: COOL DOWN THAT DOG. NOW! Any way you can! Flowing water works best. Lay the dog on the lawn. Take the sprayer off the hose, turn the faucet on full and run lots of water over the dogs belly, neck and between the legs. Don’t let up. If you can, use ice on the belly, chest and head. Those cooler bags you have in the freezer for lunch boxes and picnics – pull em out. Frozen bags of vegetables will help.. We’ve even used the frozen icepops in plastic tubes when we had to. I’ve heard you can rub alcohol on the ears. Do everything you can think of. A minute can be the difference between life and death. Don’t stop until the dog stops panting. If you have lots of ice or ice packs to pack the dog in and help to get to the vet, do so. But frankly, you can probably do as much with the hose as they will right now. Keep checking the temperature. You need to get the core temperature to 101 and keep it there. If you stop the hose and the temp starts back up, you are not done. Follow up: This is important. Your dog needs you to do this and you should not skip this step. If you got the temperature down successfully and your wet dog is now napping on the kitchen floor, catch your breathe and then call and make a vet appointment. You need a follow up blood profile to be sure you have not had any heat damage to vital organs such as the kidney or liver. You don’t have to run there right that minute. But do it within a day or two. If there are problems, they are best treated quickly. And call us. Call or email me (fogdogs@comcast.net) if you’ve had an overheat with your dog. We all learn from each other. Tell me what worked and what didn’t. What obstacles you encountered. What you’ll do “next” time. Keep those Puppies Cool! Love, Peace & Greyhounds! >When my first greyhounds temp. went sky high my vet. told me to put towels soaked in alcohol around there feet and legs also. She said that would bring the temp. down pretty fast. >I always keep a fresh bottle of unflavored Pedialyte in the fridge. 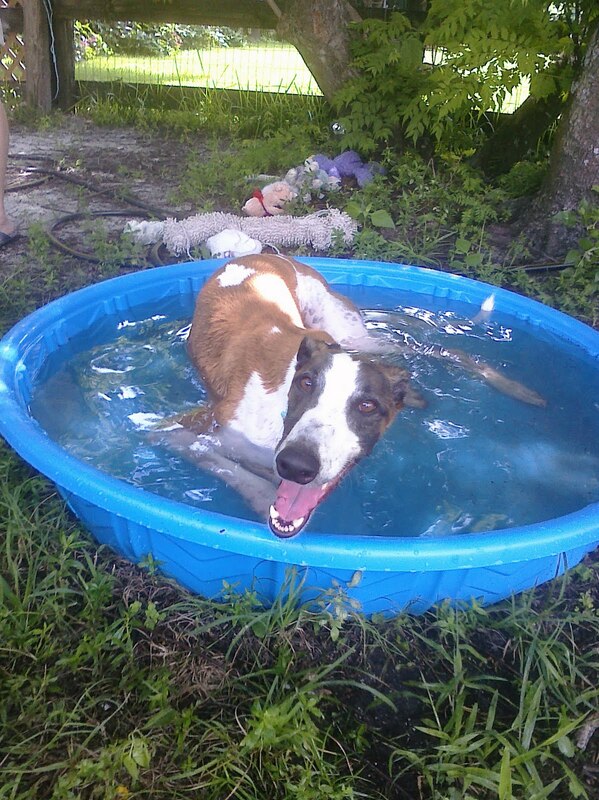 It is much better than just plain cool water when the hound is overheated. My Vet told me about it years ago and it does work! >also,you need to remember to keep them off the asphalt! that black, sticky roadway WILL burn the pads off the dog quickly. OUCH! WALK THEM ON THE GRASS IF YOU CAN. their paws will thank you for it.